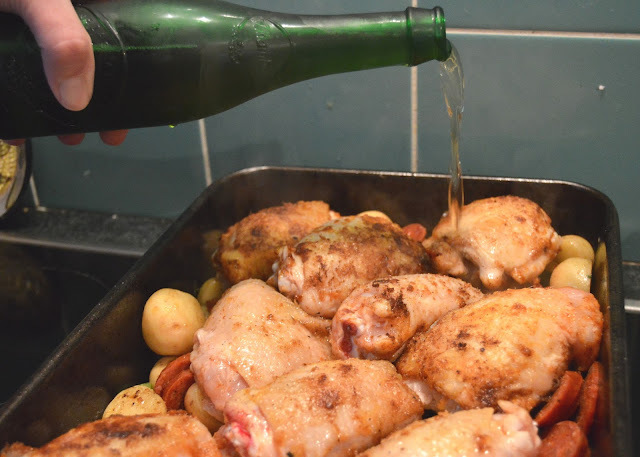 Time to be an Adult: Cooking with Cervezas Alhambra Reserva 1925 - WIN your own supply! I have two loves; food and travelling. The travelling at the moment is pretty limited to the UK which means my food experiences cover the whole world! Sushi, thai curries and pizzas made with hand stretched dough immediately transport me into the tastes and smells of their country of origin, but for a long leisurely lunch or dinner with friends I'm usually drawn to something of Spanish origin. A big pan of paella, full of inviting seafood and succulent chicken, or a tortilla with soft potato and spicy chorizo...good hearty help-yourself food with fresh, light flavours mean there is something comforting and relaxing about Spanish cuisine. I was lucky enough to recently be sent a beautiful presentation box of Alhambra Reserva 1925 beer. This has been inspired by the first beers that were produced by Cervezas Alhambra by their factory in Granada, Spain in 1925. This beer is a beautiful golden colour, with a deeper hop taste than the mass produced Spanish lagers I've drank before, similar in taste to a British pale ale. The dark green bottle is elegantly understated, without labelling, letting the artisan manufacturing process and 90-year old Alhambra name speak for itself. We of course sampled some of the beer, ice cold, served in my very special limited edition glasses and it was a beer to be savoured. Because Alhambra Reserva 1925 has a full bodied flavour I think it's best to enjoy with food and is a beautiful ingredient in lots of Spanish inspired recipes. Handful of fresh thyme sprigs, woody stems removed and leaves finely chopped. In a large bowl combine the flour and paprika and mix together. 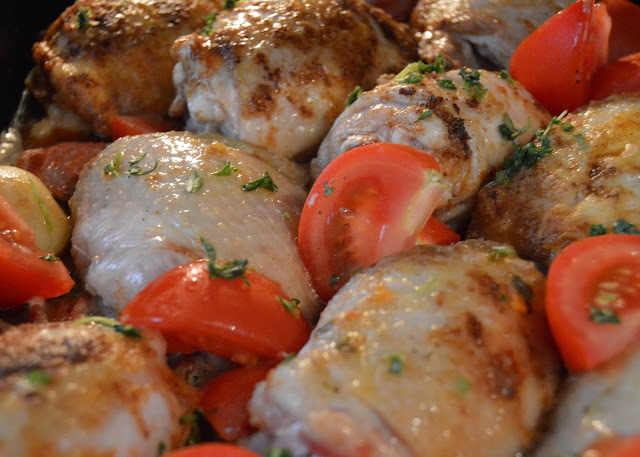 Take 3-4 chicken thighs at a time and drop into the bowl and coat with the flour mix. Heat half of the oil in a large flameproof heavy roasting tin over a high heat and fry off the chicken thighs for 5-10 minutes until brown all over. Set aside and repeat with the remaining chicken. Heat the remaining oil in the pan and add the potatoes into the hot oil carefully, cooking for 5 minutes until they are starting to brown. Add the pancetta and chorizo, turn the temperature down to a medium heat and cook for another 5 minutes until the chorizo starts to release it's oil. 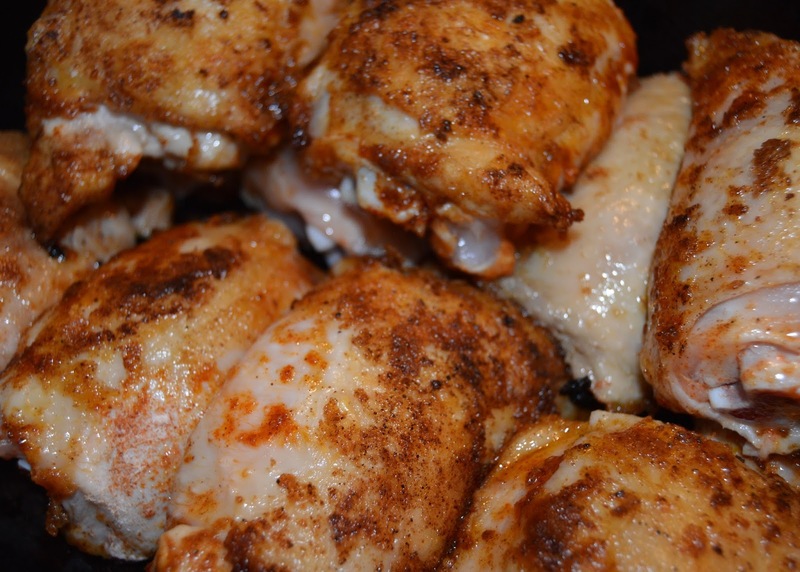 Return your chicken to the pan and pour the beer over the thighs. Bring to the boil and cook until the liquid reduces by half. Remove from the heat and add the stock, thyme, spring onions & tomatoes. 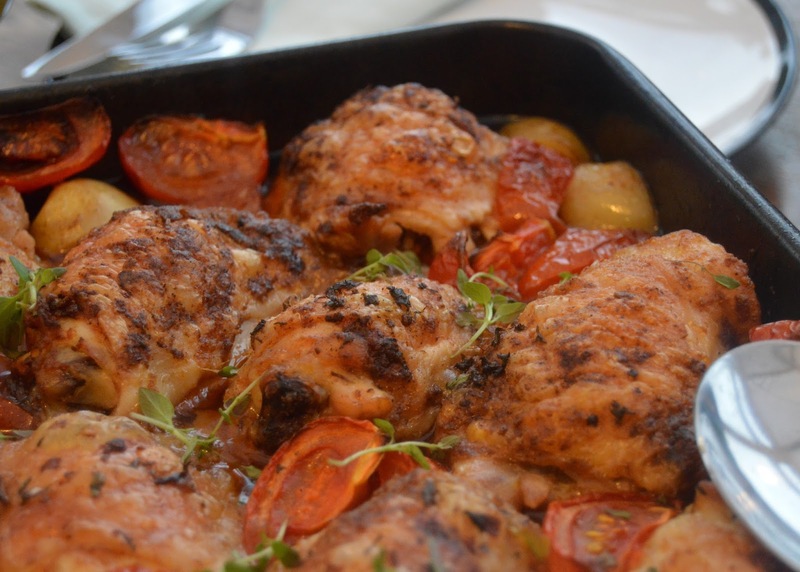 Bake for one hour until the chicken is cooked through. sprinkle with extra thyme and serve with crusty bread, Alhambra Reserva 1925 and friends! You can win your own special edition of 2 x 75cl Cervezas Alhambra Reserva 1925. What would be your perfect tapa for pairing with Alhambra Reserva 1925? Comment below and you could win a heritage set of Alhambra Reserva 1925 beer to enjoy with your own tapa creations. The winner will be choosen by the Alhambra team after the closing date of 21st September 2015 and will be looking for the most innovative ideas so get thinking! I was sent a presentation case of Alhambra 1925 for the purpose of this recipe post. Congratulations Midwife & Life - Alhambra have chosen your tapa idea as the winning one! Please can you email me your address details so that I can pass it onto the team who will send your prize out? calanderyou@gmail.com Well Done! This looks SO GOOD. 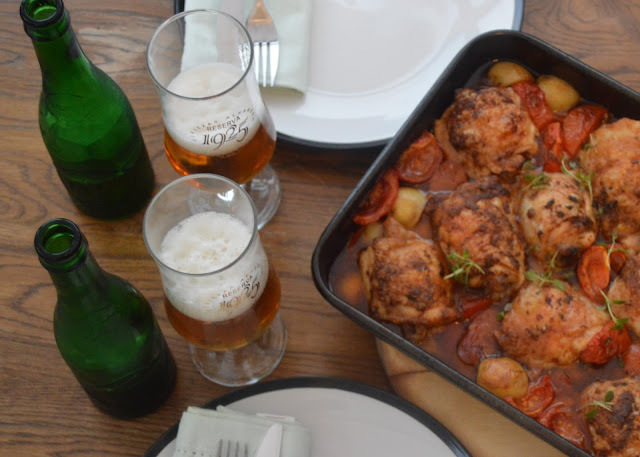 Beer, chicken, chorizo and it's a traybake. I think we'll be cooking this for certain. I think I would pair the Alhambra Reserva 1925 with some deep-fried peppery squid and a garlicky aioli dip. I love finding vegetarian tapas so I would pair Alhambra Reserva 1925 with some beautiful sautéed mushrooms served with olive oil and garlic alioli!